Cakes are an important part of any celebration-a birthday, an anniversary or a wedding. Without cakes, any celebration is thought to be incomplete. Various varieties of mouth-watering cakes are available with the bakers such as chocolate cake, vanilla cake, strawberry cake, pineapple cake and many more. The beautiful decorations over these cakes make them even more tempting. However, sometimes things go wrong with a cake and the most wonderful cake turns into the worst. Acake has to go through various processes such as baking, stacking and frosting before finally reaching those who wish to eat it. Alternatively, some cakes are made in such a way that they are hated by people instead of loving them. 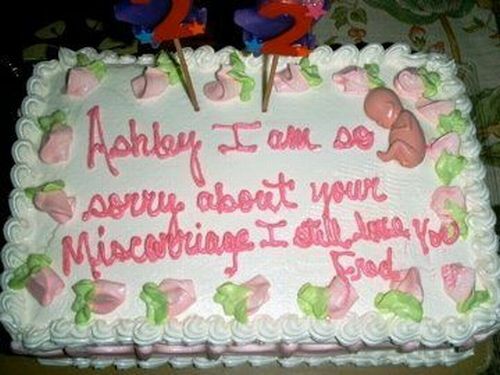 One such example of a bad cake is this strange birthday surprise. Whoever Emma is, we hope she had a happy birthday in spite of this terrible cake decoration. Another such example is from U.K. where a cake in the form of Amelanstic Burmese Python was made for a birthday party. This cake was made on the wish of Claudia, a 6 six year old girl who wanted to scare her friends on her birthday. The exact resemblance of the cake with the dangerous snake made it worth hating. Interested in learning how to cook? Got some skills to share? Check out the cooking classes and instructors on HeyKiki and find the perfect class for you, in your neighborhood. If you’re interested in cultivating your taste in good company, log in and connect. You can even create your own profile. If cooking isn’t your thing, but you’re interested in building community, the opportunities are endless. Whether it’s tennis or punk rope, cinematography or palmistry, you can find the perfect practice buddy today. This entry was posted in Cooking and tagged anniversary, baking, birthday, cake, chocolate cake, frosting, pineapple cake, stacking, strawberry cake, vanilla cake, wonderful cake by Sarah James. Bookmark the permalink.